FunctionGear pumps are used in many applications to deliver liquids (media) or as a forcetransmitting drive for hydraulic motors. The gear pump delivers the medium evenly from the intake side (intake), through the gears and to the thrust side (exhaust). Among other applications, gear pumps are used in vehicles as a fuel pump, oil pump or coolant pump. The chemical industry uses gear pumps to deliver organic and inorganic chemicals. Within construction machinery and agricultural machinery, gear pumps are used as a drive for hydraulic motors, for example. on the application. The plain bearings must therefore offer high resistance to abrasion, good resistance to erosion, chemical compatibility and low swelling tendency. 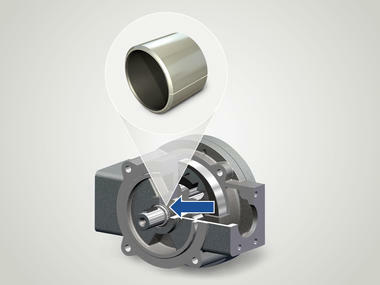 KS PERMAGLIDE® P10 plain bearings meet these requirements. The excellent dry-running behaviour of KS PERMAGLIDE® P10 plain bearings also ensures a low level of wear in the mixed friction operation that occurs when the pump is switched on and off. Material: lead bronze sintered onto a steel base, friction-minimising additives PTFE and lead. In damp environments in particular, this sliding layer system provides outstanding protection against corrosion. Moreover, lead and PTFE have an extremely low absorption tendency. Absorption of the surrounding fluids, swelling of the materials and chemical damage to interacting sliding partners are prevented. The result is dimensional stability and optimum corrosion protection during use. Among other things, gear pumps comprise a multiple-component housing, gears and gear shafts. The material P10 contains lead and must not be used in the food sector. The material P14/P147 (unleaded) can be used in the food sector. We will be happy to draw up an offer for your application. Submit an enquiry here.